My 80+ year-young business partner and I are going out of business. The distance we both have to travel coupled with her health issues has made it difficult for us to continue at the flea market. The bad news is that I now have no excuse for hoarding and re purposing. That can mean only one thing…well, two things. To Saint, it would mean building a new out building; for me, a lake house. How would you vote? At any rate, we still have booth space through February, and I am busy trying to finish projects to sell. Saint hasn’t figured this out, yet, but when I get my junk stuff out of the garage, it is getting a major cleaning/re-organizing…oooh, I feel a blog post coming soon. After all, I must prove to him that it is his junk treasures that have been taking up all the space. 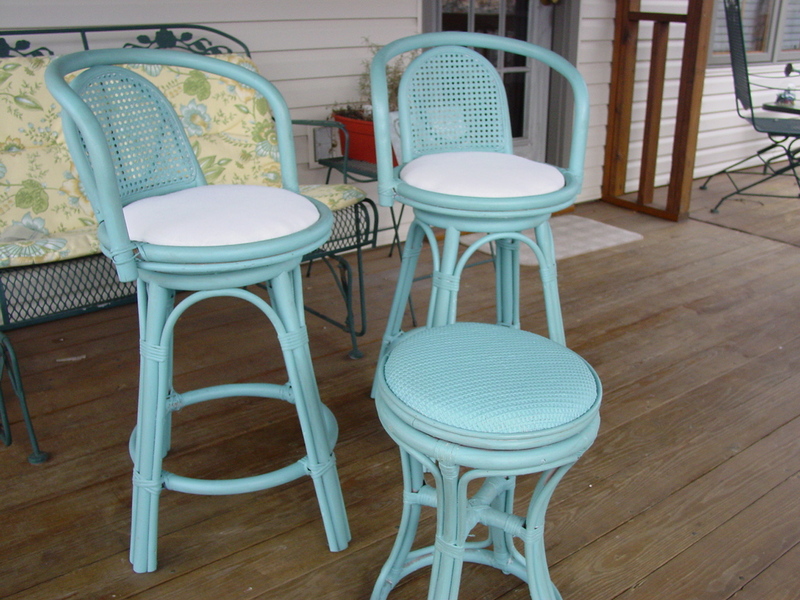 This week, I made my own chalk paint and used it to refinish some bar stools. 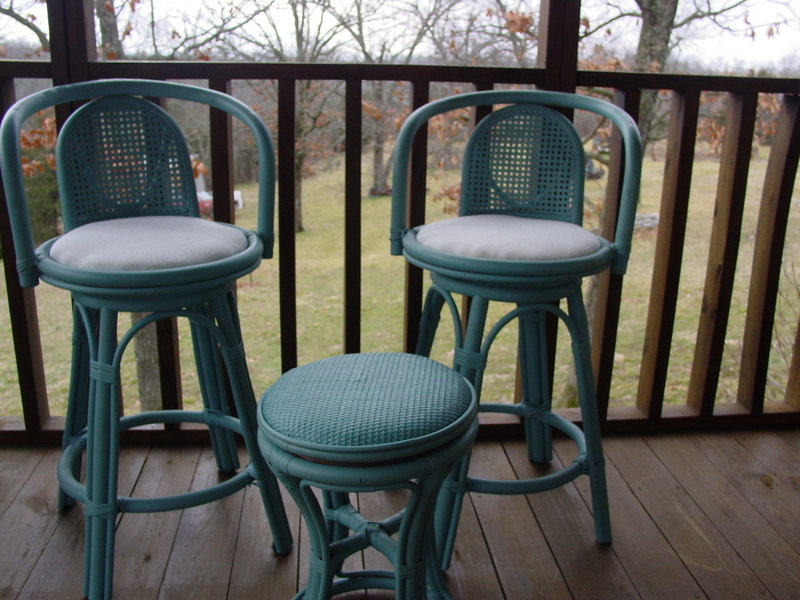 I got the stools at an exceptional price because they had been sitting in a booth for ages quite awhile. No wonder. Who else but a re-purposer could see the value. In fact, I completely failed to take a before picture, but think dark bamboo, scratched finish with rickety seats covered in an vinyl tablecloth. Yep, I’m not kiddin’. 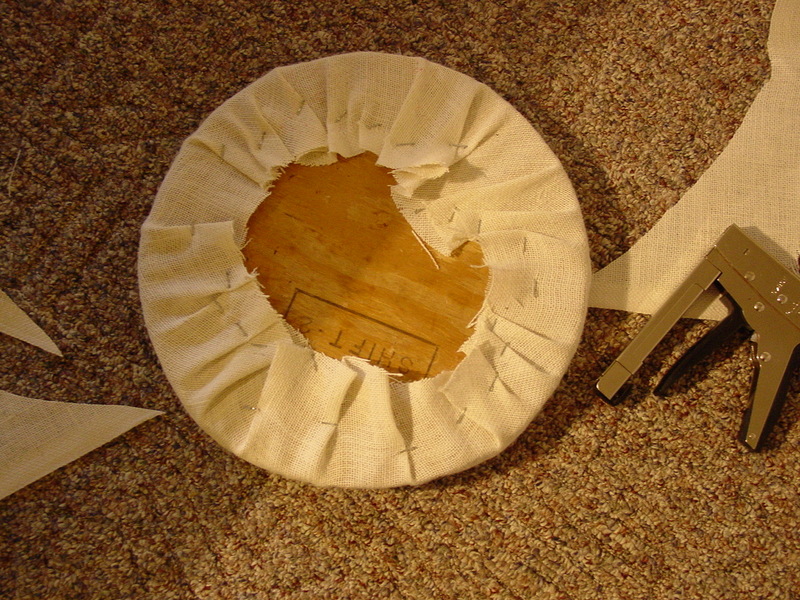 In fact, I did take a picture of the covering after I removed it. Major yuk factor, right? 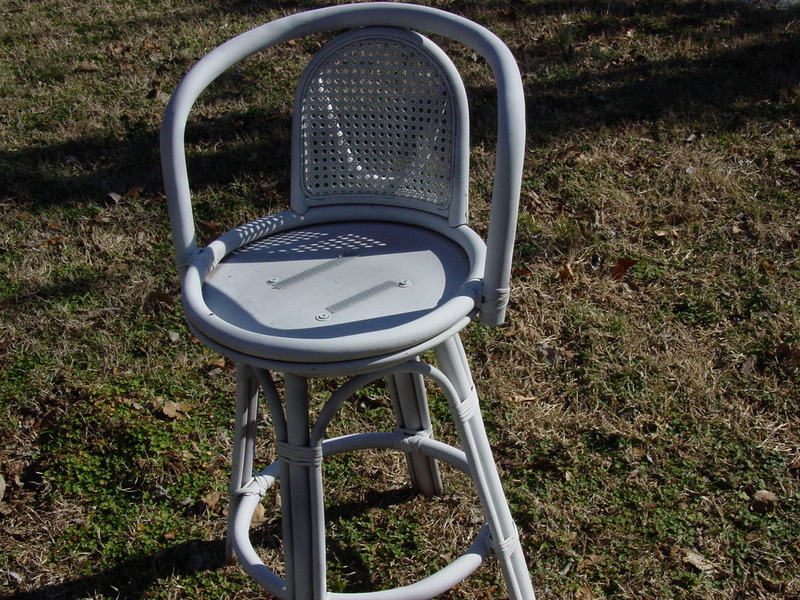 So, this is the picture of one stool after saint disassembled one unnecessarily and we sprayed a thin coat of Zinsser primer on it. With the chalk paint, I’m told you don’t need to do that, but these were pretty rough! And here are the supplies I used to make the chalk paint. 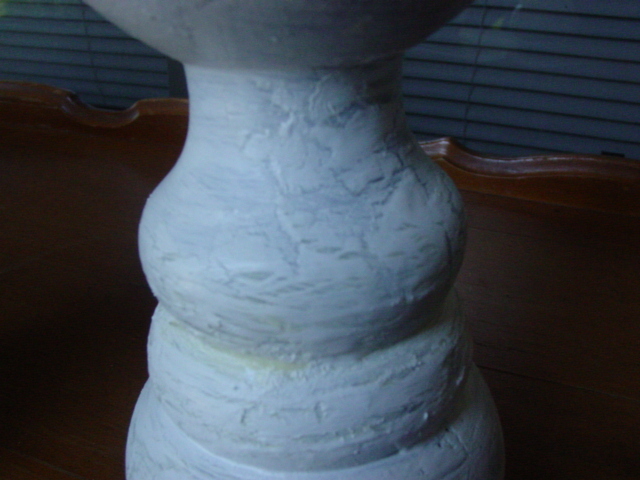 I used the formula of one cup latex paint and 2 teaspoons unsanded grout. Stir, stir, stir, and there you have it. 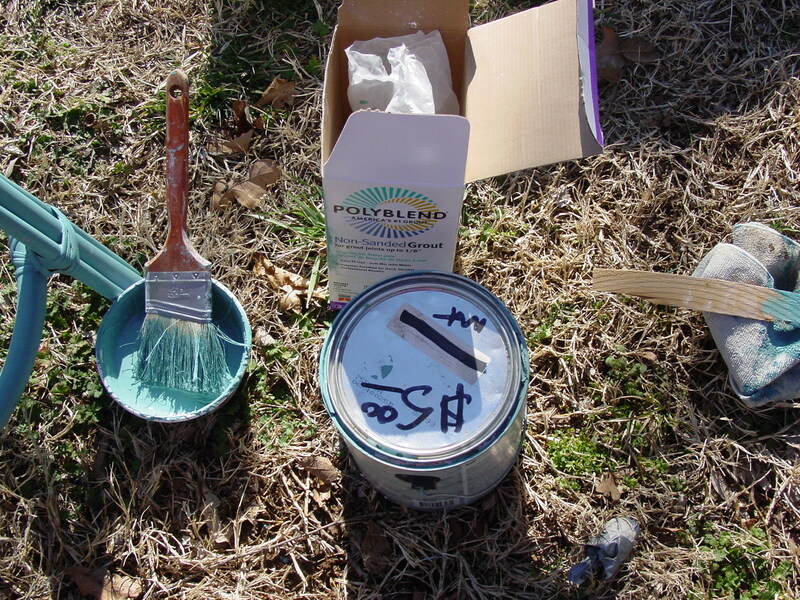 A paint that is supposed to adhere to almost anything and be very durable after curing. I brushed it on. Yes, it took a couple of hours to do all three of the pieces I had, but it was a perfectly beautiful day, especially for February, and I enjoyed being out on Redbud Ridge with all the birds and squirrels. Don’t you absolutely love that color? Somebody didn’t, because I got it in the return/mismatched bin at Lowes for $5.00. The whole gallon. I was debating about the seat fabric, and I got a piece of lime green scrap booking paper, just to see how the color would look with the turquoise. It was fabulous! 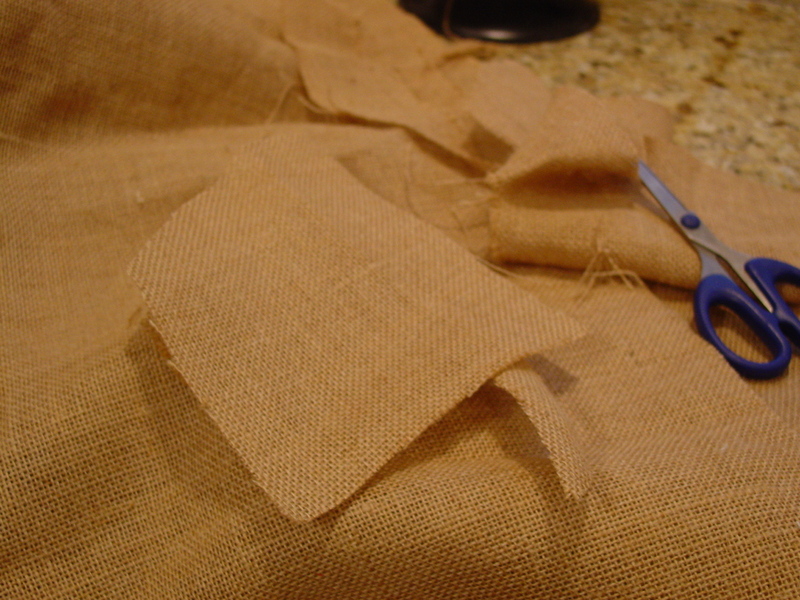 But, that would definitely limit my buyers, so I opted to use the natural burlap, instead. Saint put all three back together for me. (He is really going to miss that flea market booth, isn’t he?) And these three babies are ready to go. Did I mention that they swivel? 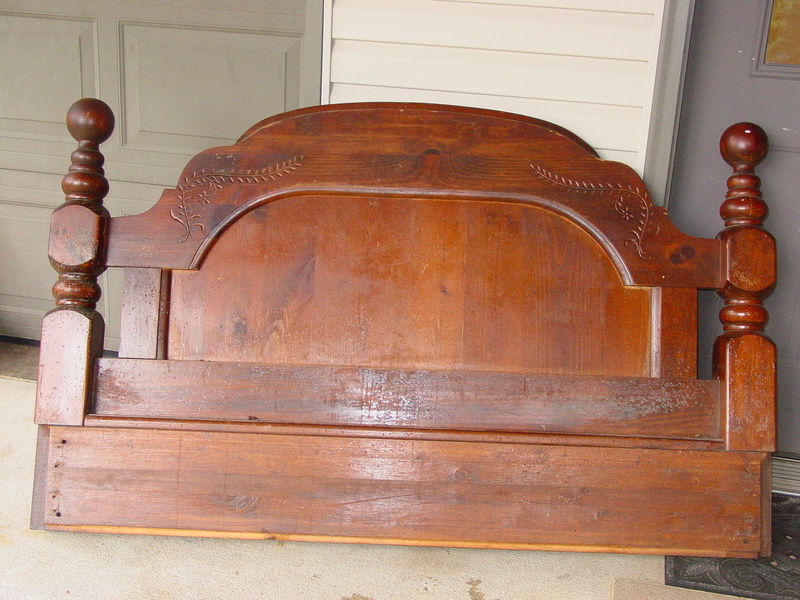 And, they would look smashing with a shabby chic white table or repurposed dresser turned bar, wouldn’t they? They look pretty nice on my deck, don’t they? Maybe I should keep them?? Oh, for that lake house! The older I get, the harder it is to make even the simplest choices. My Christmas decoration closet runneth over, and that’s a problem because it is also the safest place to go when a tornado comes through. Looking at it, you would think one already did. Every year, I drag out plastic storage tub after tub, decide what I want to use, and organize carefully place cram the rest back in the closet. Since I have started the flea market booth, it is easier to downsize because I have a place to go and a purpose. Of course, I would have kept all the kid’s first ornaments, precious handmade ornaments from them and students I had in the past, heirloom decorations, but we lost those one rainy year when our basement flooded. All the ornaments in the storage room were in cardboard boxes at the time; we had never experienced flooding before. Sad, but we move on. Thank goodness our pictures were stored in the attic! Since then, I have managed to hoard collect a lot of other stuff. So, these are some of the things I kept and used in decorating for Christmas this year. Our basement is a bit more rustic than our traditional rooms upstairs, so this rusty candle jar, purchased from a little shop in West Virginia, fits in perfectly. It came from our daughter, and reminds me of the tears and joy when she landed her first job as a TV reporter at WBOY. It is surrounded by some collectible Boyd’s bear figures I acquired from teacher friends and some old baskets and wooden cheese boxes. This antique table belonged to my parents, the scarf was crocheted by a family member, and the very old basket containing pinecones was given to me by my dad…it belonged to a great aunt. This creche wreath was given to us by my SIL. Her mother made one for each of the sibblings, and I have treasured it and display it every year since. 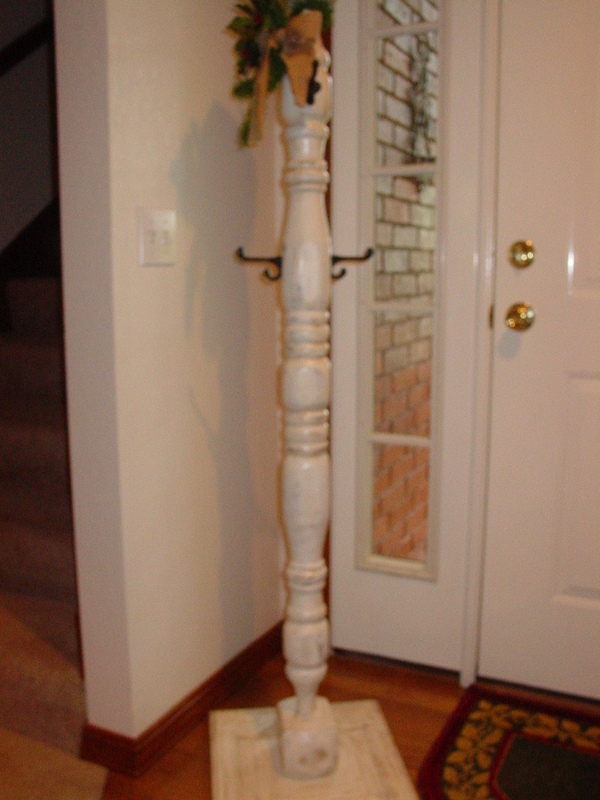 It is sitting on the ledge of the stairwell along with two kings that our son had special-made at a local shop. Keepers. This vintage Santa has been around for many years and is very versatile. He sometimes sits on the porch to welcome guests. At other times he appears in various rooms of our house. My mother and I made this arrangement when we moved into our new home some 18 years ago. I change out the ribbon, candle, and globe occasionally, but the basket and greenery remain. I have it on the dining table this year, and the antique secretary that belonged to Saint’s great grandmother holds a newer mirrored nativity scene I picked out for my birthday on a visit to Uncle Franklin and Aunt Jane’s. I like the juxtaposition of the metal trees I picked up just this year from a flea market in Dexter during our girl’s weekend. I’m keeping this Pinterest project that I did last year. I made the garland from twine and old book pages, the balls from rag strips, and the bow from burlap, of course. 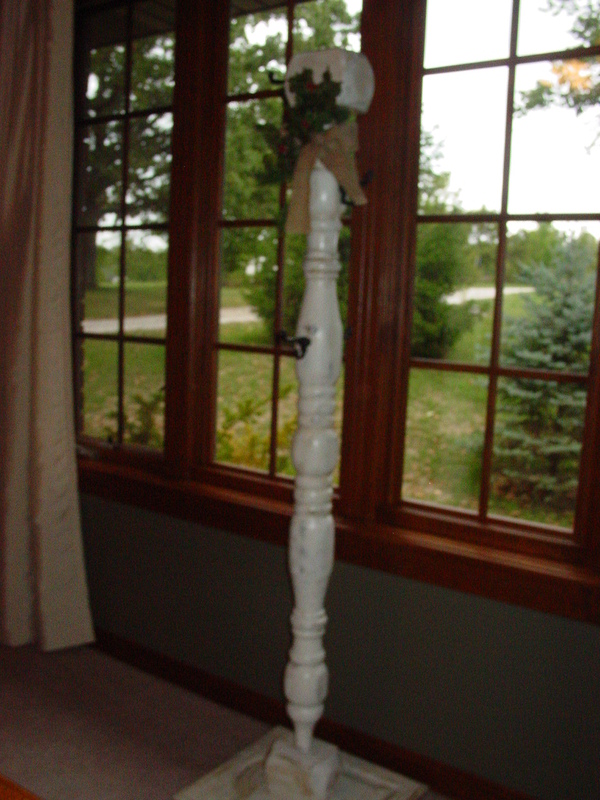 I used to decorate every room in the house. I still couldn’t resist adding this handmade snowman box from a vacation with friends in Wisconsin to the guest bathroom. This is the mantel, this year. It contains two angels, a gift my BFF gave me a few years ago, and, if you look carefully, you will see the antique oval frame I upcycled in the fall. I love it so much, I incorporated into the Christmas. It’s a keeper, I think. The glass collection of snowmen and trees get a place on the coffee table this year. 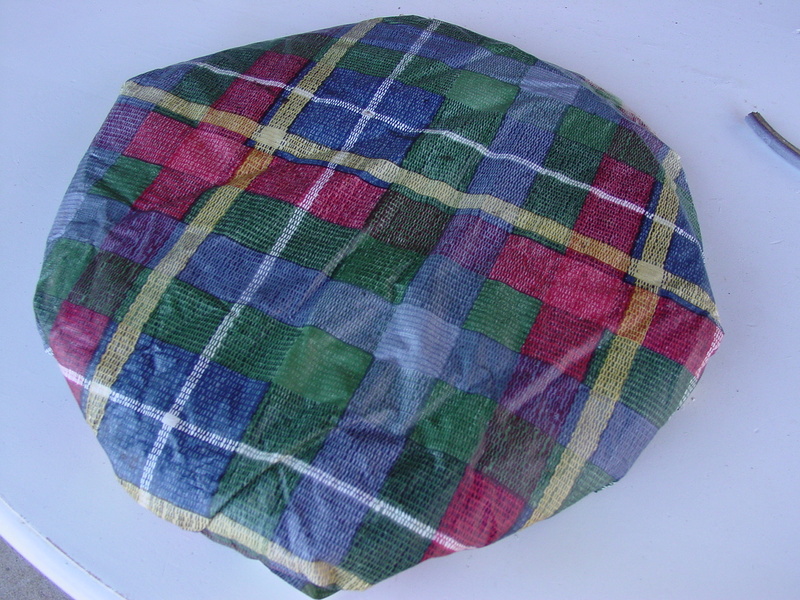 I love the little ones inside the cloche. And finally, I have very few sentimental ornaments left, so…I like gaudy trees and I cannot lie! I know. You’re wondering what I possibly could have pitched<del sold, but trust me, I have receipts to prove it. Sales have been pretty good at the flea market this month! 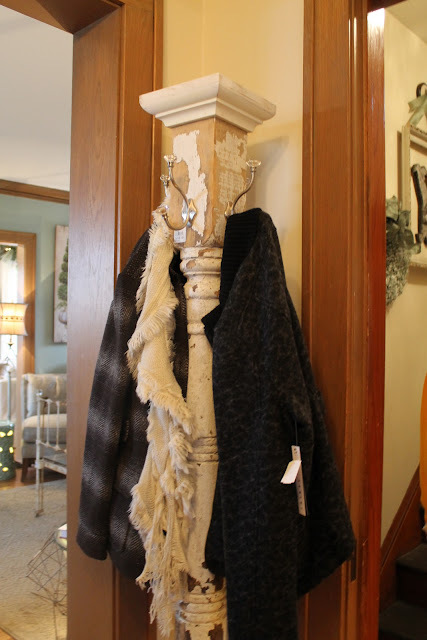 I pinned it from Hammers and High Heels here http://hammersandhighheels.blogspot.com/2011/11/bachmans-2011-holiday-idea-house.html. Visit this site, if you haven’t already, for a veritable feast for the imagination. The images and ideas are like eye candy for the soul. 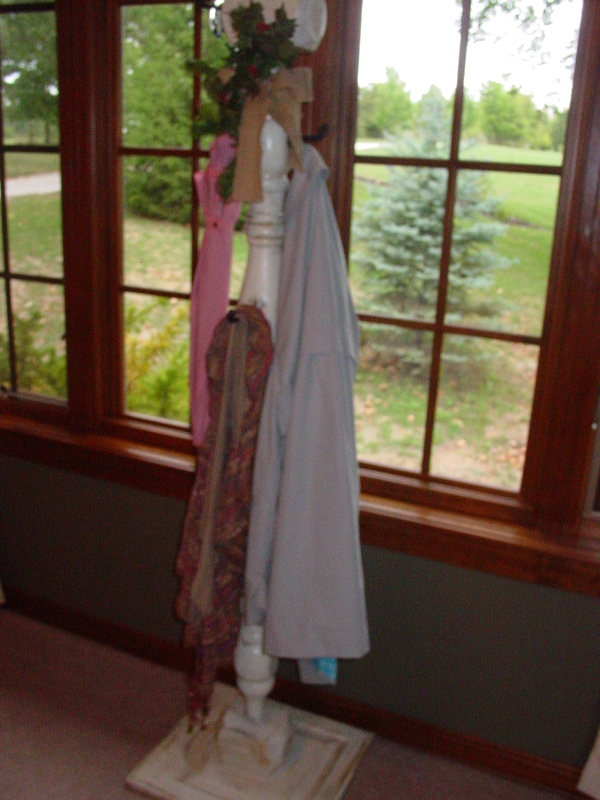 My humble project and miniscule non existent photography skills can’t compare, nevertheless, the transformation from ugly door/bed post to shabby chic coat rack is quite cute, don’t you agree? Here it is all functional and everything , staged with an umbrella, scarf, and trench coat. The burlap and greenery are easily removed so that seasonal decor (I’m thinking colorful silk ribbons and glitzy beads for New Years, white lace and pearls for Valentine’s Day, and violets and eyelet for Easter. And in between, it looks just fine naked. 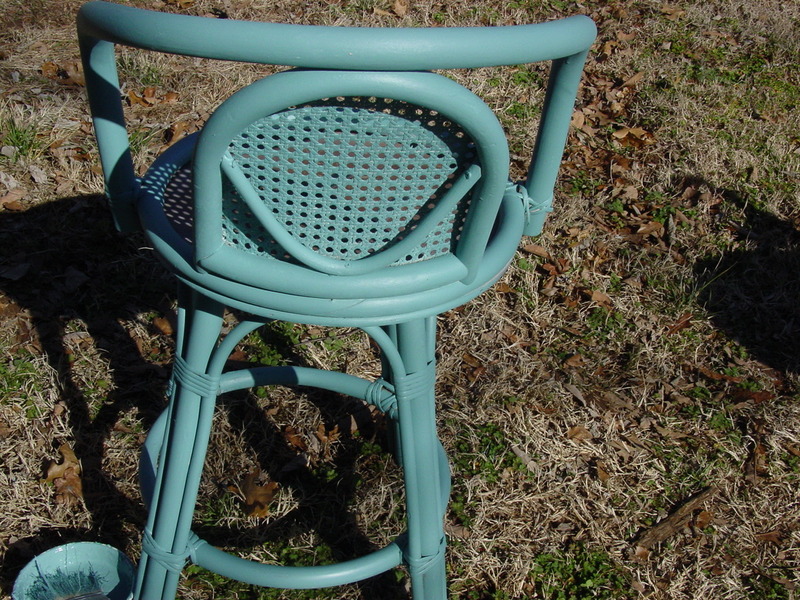 The best part, it was practically free since I made it from other projects, and I am saving resources by upcycling treasures that were likely headed for the dump. This is going into my Christmas display at Mike’s Unique. Check it out at booth M4 in late October, and let me know what you think! wouldn’t fit anywhere in my house. So I asked Saint to take it apart and cut some pieces off for another project aka ugly door part II. We ended up with about twenty pieces to use in various crafts up-cycles. These two bed posts started to take shape in my mind. I cleaned them with TSP and put a coat of Zinsser primer on them. 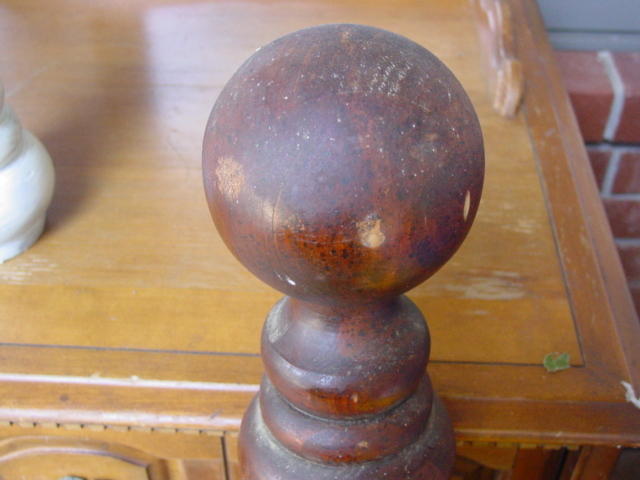 Only then did I remember that I’d been reading some neat blogs about “crackling” paint with Elmer’s Wood Glue. It would probably have been better to do that process before the first coat of primer, but, well, what did I have to lose? After the primer dried, I smeared carefully wiped the glue all over the post and waited patiently (you know better) for the glue to become tacky. Next, I painted another coat of the primer over that. It worked! It really worked! 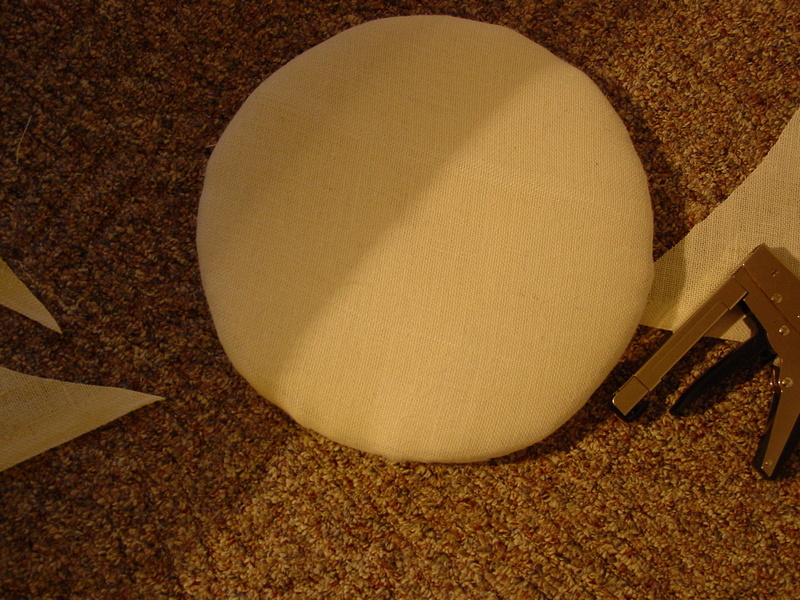 A final coat of linen white finished the painting part. 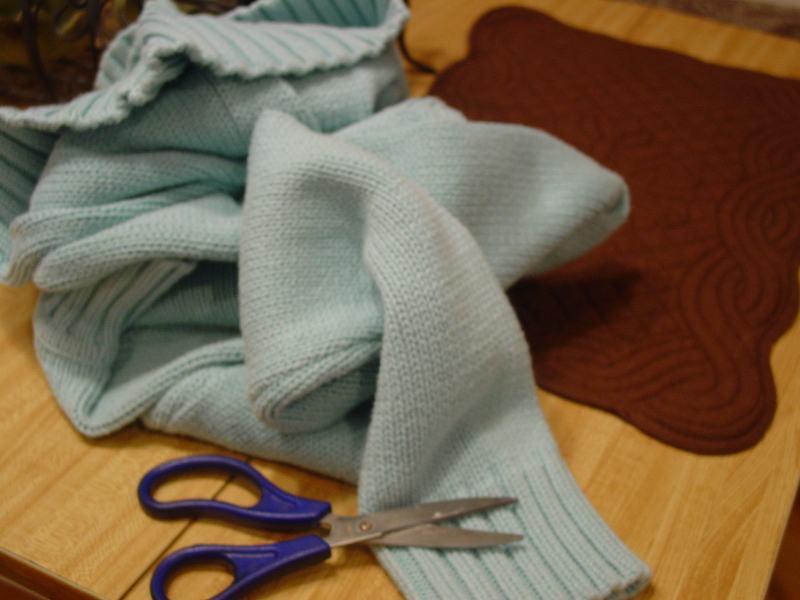 The rest of the project involved last year’s old sweater that was too little had shrunk in the dryer. And some burlap, of course. 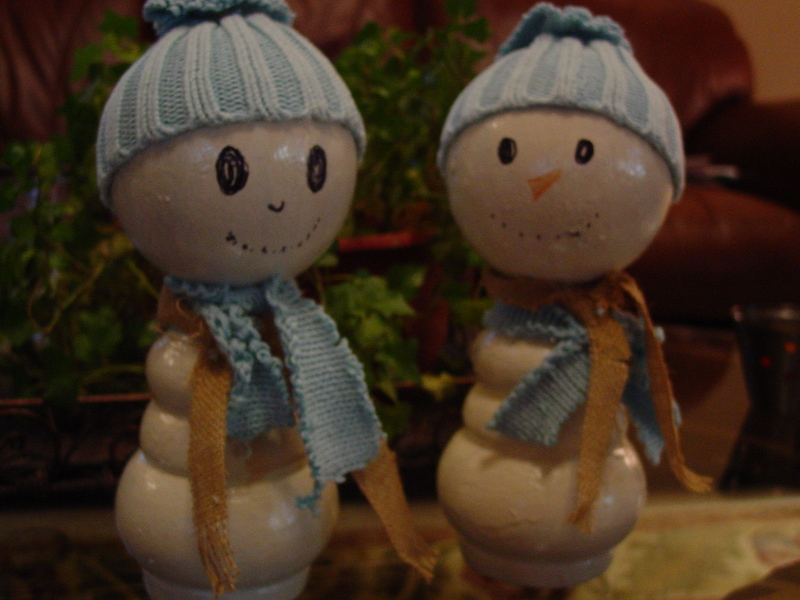 So, you might have guessed by now that those two bed posts have become the sweetest little snowmen. I plan to add them to the awesome Christmas display that I’m working on for the flea market, but they may just adorn a table, mantel, or shelf right here on Redbud Ridge. Lesson for the day…don’t throw ANYTHING away. Please don’t tell Saint I said that. He will never clean out the garage!